Recognizing that patients need better information about what care they truly need in order to have these conversations with their providers, patient-friendly materials have been developed and many consumer groups are working on disseminating them widely. Choosing Wisely recommendations should not be used to establish coverage decisions or exclusions. Rather, they are meant to spur conversation about what is appropriate and necessary treatment. As each patient situation is unique, providers and patients should use the recommendations as guidelines to determine an appropriate treatment plan together. Massachusetts Health Quality Partners is leading a multi-stakeholder effort to advance the ABIM Foundation's Choosing Wisely® campaign in the Commonwealth. The goal of this effort is to encourage physicians and patients to discuss medical tests and procedures that may be unnecessary, and in some instances cause harm. Reducing unnecessary medical care can improve quality for Massachusetts patients. Build broad public awareness and interest of Choosing Wisely in Massachusestts. Engage providers to integrate Choosing Wisely recommendations and materials in their practice. Engage patients and families to use Choosing Wisely consumer materials to become better informed about the decisions and choices they need to make about their health and health care. Identify ways to engage providers and patients to better communicate in using Choosing Wisely materials. Healthcare interests across the state have come together to encourage patients to discuss with their physicians whether diagnostic imaging in the treatment of lower back pain and persistent headaches is appropriate. The local effort includes more than 20 organizations participating in Choosing Wisely Massachusetts and is being led by Massachusetts Health Quality Partners (MHQP), of which MHA is a member. By examining 2013 clinical quality data, MHQP found that about 20% of the imaging tests that the state's primary care physician practices ordered for lower back pain are not indicated. The American College of Radiology points out that most people who seek medical help for headaches have migraines or tension-type headaches, and that all that is usually needed for doctors to diagnose them is a careful medical history and a neurological exam. Adding a CT scan or MRI rarely shows why a headache occurs and it does nothing to ease the pain. Participating organizations and agencies will be disseminating Choosing Wisely information to their constituents - providers, patients, and consumer groups - throughout the month to raise awareness and interest in the campaign. MHQP has been leading the Choosing Wisely Massachusetts Campaign for two years with support from the Robert Wood Johnson Foundation and the ABIM Foundation; ABIM is behind the national Choosing Wisely Campaign, in which various medical specialties drew up lists of evidence-based recommendations that patients can use in their discussions with their doctors. "People suffering from lower back pain or frequent headaches want to know what's going on and they want relief," said Steven Defossez, M.D., MHA's V.P. of Clinical Integration and a practicing radiologist and MRI specialist. "Cross-sectional imaging tests are powerful tools, which when applied thoughtfully can result in accurate diagnoses and appropriate care plan formation. Therefore it's not surprising that patients often look to an MRI or CT scan for answers. However, diagnostic imaging may not always be the best option. Over-utilization of diagnostic imaging is wasteful at best and may actually be harmful. It's important for patients to work collaboratively with their caregivers, following evidence-based best practices, to get the best outcome." As the statewide regional health improvement collaborative in Massachusetts, Massachusetts Health Quality Partners (MHQP) is uniquely positioned to leverage and connect its existing initiatives and partnerships - including its strong multi-stakeholder governance structure of actively engaged physician, health plan and patient/public councils - to introduce and promote the Choosing Wisely® campaign in Massachusetts. 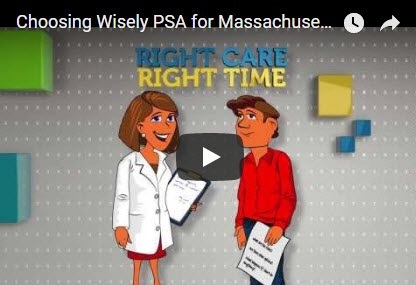 MHQP has also launched the Choosing Wisely Massachusetts Website and conducted awareness activities via its social media outlets and a statewide radio PSA. MHQP has begun to recruit "Choosing Wisely champions" from local specialty societies, such as the Massachusetts Radiological Society and Massachusetts Medical Society's Committee on Interspecialty, as well as to support local uptake of the campaign and materials by individual organizations including health plans, employers and provider organizations. MHQP's future plans include rolling out campaign materials in spring 2014, starting with recommendations around imaging for lower back pain. MHQP will also support the continuing work of its partners to integrate Choosing Wisely within their respective institutions and organizations. Massachusetts Health Quality Partners is a nonprofit coalition of health care providers, health plans, employers, patients, academics and government agencies working together to promote improvement in the quality of health care services in Massachusetts. MHQP's mission is to drive measurable improvements in health care quality, patients' experiences of care, and use of resources in Massachusetts through patient and public engagement and broad-based collaboration among health care stakeholders.